En caso de emergencia llame al 911 y Xcel Energy. How do people use energy? Answer: People use energy in many ways! Most of the things we do with our bodies require energy, whether it’s chemical (such as digesting the food we eat) or mechanical (such as swinging a tennis racquet). We also use energy to heat and light our homes, for transportation, for entertainment (TVs, MP3 players), and for cooking. See if you can come up with some more ways yourself—there are many! What are the different kinds of potential energy? Answer: Potential energy is energy stored in an object that, when engaged, allows work to be done. Examples of the three different kinds of potential energy include a ball held above the ground (gravitational potential), a pulled back bow ready to send an arrow (elastic potential), or a can of gasoline (chemical potential). Answer: To generate solar power, energy from the sun is collected in solar panels, which are made up of solar cells, or modules, that capture sunlight and convert it directly into electricity. These panels are known as photovoltaic, or PV. (Photo is Greek for light, and voltaic pertains to electricity.) On some buildings, several PV panels are grouped into solar arrays. The electricity produced by solar panels can be used right away, fed into the power grid for others to use, or stored in a battery so it is also available on cloudy days. Some solar panels contain tiny tubes filled with water that absorb heat from the sun. Placed on rooftops, these can supply hot water for individual buildings. Concentrated solar power can also be used to heat water into steam that spins turbines at electric power plants. Answer: Electricity is a form of energy that starts with atoms, the tiny particles that make up everything around us. Even tinier particles called electrons orbit the centers of atoms. When electrons move between atoms through a wire, electricity results. Click here to discover more information about electricity in our Electricity Frequently Asked Questions section. If I leave my cell phone charger on and it's not charging my phone, am I using electricity? Answer: Yes! Chargers continue to use electricity after the item they are charging is fully charged. They also use electricity even when they are not connected to a device. In fact, only 5 percent of the power drawn by cellphone chargers is used to charge devices. The other 95 percent is wasted by chargers that are left plugged in! To prevent this energy waste in your home, get yourself (and your family) into the habit of unplugging all chargers when not in use. Where does the electricity in a lightning bolt come from? Answer: The electricity that produces a lightning bolt starts in thunderclouds, when small bits of ice (frozen raindrops) collide as they circulate. These collisions create electrical charges that fill up the cloud. The positive charges form at the top of the cloud, and the negative charges form at the bottom. Because opposites attract, the concentration of negative charges at the bottom of the cloud causes a positive charge to build up on the earth beneath it. The electrical charge from the ground happens around anything that stands out, such as trees, mountains, or people. The charge reaching down from the clouds eventually contacts the charge rising from the earth, and ZAP! That’s when a lightning bolt happens. Are people getting shocked every day? Answer: Yes! There are about 6,450 significant electrical shock injuries per year in the United States, which is almost 18 per day! And about 240 people die each year from electrical shock at work. You can learn to stay safe around electricity and prevent electrical shock by studying this website. If shoes are on the power lines, what should you do? Answer: Don't try to take them down yourself—you could be seriously hurt or even killed if you touch the shoes or the line they are on. Instead, call your local electrical utility to ask if they can take them down. If someone gets shocked and you see them on the ground what should you do? Answer: If someone has been shocked, there's a chance they are still in contact with the source of the electricity. Do NOT touch them or anything they are touching—if you do that you could become part of electricity's path and be shocked or even killed. Warn others to stay back too. Quickly call 911 for help, and tell them it is an electrical accident. When you are sure the victim is not in contact with the source of the electricity, ask an adult to give first aid for electrical injury. This may include CPR. Don't touch burns, break blisters, or remove burned clothing. Electrical shock may cause burns inside the body as well, so be sure the person is taken to a doctor immediately. Could the flame on my stove get too hot and start a fire? Answer: You are correct to wonder about the safety of your gas stove flame. However it is not its heat that is potentially unsafe. A stovetop flame is unsafe when flammable objects—like papers, a dishcloth, or toys—are left nearby, because they could catch on fire. To prevent this happening, keep flammable items well away from the stove, and never allow the flame to be bigger than the size of the pot or pan that is cooking on it. How is electricity produced in power plants? Answer: In power plants various energy sources are used to turn turbines. The turbines turn electromagnets that are surrounded by heavy coils of copper wire. The moving magnets cause the electrons in the copper wire to move from atom to atom, generating electricity. To learn more, please visit our Energy Classroom at http://www.energyclassroom.com. Does recycling and reusing products help reduce the amount of energy used? Answer: Yes! When you recycle, you save energy. That's because making new products from recycled materials requires only about a quarter of the energy that is needed to make the same products from raw materials. Reusing products saves even more energy. When you reuse existing products, you avoid buying new ones, thus saving the energy that would otherwise be used for new product manufacturing and transportation. We can save a lot of energy by rethinking the way we make things in our society. Reusing and recycling are a key part of that thinking. If products are used, reused, and then recycled, we reduce both the need for raw materials and all the energy it takes to transform those materials into the products we buy. How did people know what energy was? Answer: The answer to this question depends on which form of energy you are referring to. For example, today we know that heat is a form of energy that comes from the movement of molecules. However, it was once thought to be a substance that was contained in objects and could flow between them. People called this substance "caloric fluid." It wasn't until the mid-1800s that an English physicist named James Prescott Joule proved that heat is actually a form of energy. People came to understand other types of energy in different ways, at different times. You can learn more about these discoveries by researching each of these forms of energy: kinetic, potential, electrical, nuclear, and chemical. Why is natural gas called "natural" gas? Answer: Natural gas is called "natural" because when this type of gas was first discovered, it could be used directly from the ground in its natural state, without any processing. Today, gas utilities process natural gas by removing water, sand, and other compounds so that when the gas is delivered to your home it will burn as cleanly and efficiently as possible. And, in its natural state, gas has no odor so that's why companies like Xcel Energy add a harmless, but stinky chemical to it; the odor helps people smell a leak that otherwise, in the gas's natural state, doesn't smell. Answer: To answer this question, we have to add up all the energy people use from different sources. This is difficult to do because each energy source is measured in a different unit. For example, electricity is measured in kilowatt-hours, natural gas is measured in cubic feet, and gasoline is measured in gallons. One way to add up different energy sources is to convert them all to one common unit of measurement called BTUs, or British Thermal Units. (A BTU is equal to the amount of heat required to raise one pound of water one degree Fahrenheit.) When we do this, we can determine that on average, each person in the United States uses about 300 million BTUs per year. And all of us together use about 95 quadrillion BTUs per year. That's a lot of energy! What is the difference between stored energy and energy in motion? Answer: Stored energy (also called “potential energy”) is the energy in matter due to its position or the arrangement of its parts. For example, a coconut hanging on a palm tree has stored energy because of its position suspended in the air. When the coconut drops from the tree and falls to the ground, its potential energy is converted into energy in motion (also called “kinetic energy”). Another example that illustrates the difference between these two types of energy is a twisted-up rubber band used to fly a toy airplane. The rubber band contains potential energy that is converted into kinetic energy when it untwists and turns the propeller. Answer: The sun is made up of very hot gases, mostly hydrogen and helium. About 1% is oxygen, and another 1% is a combination of other elements, including iron, nickel, silicon, sulfur, magnesium, carbon, neon, calcium, and chromium. Astronomers believe the hydrogen and helium came from the Big Bang, or birth of the Universe, and the other elements were released by dying stars. With the latest winds some of my branches are tangled in my power line in my back yard. What should I do? Answer: Removing limbs tangled in power lines is dangerous. You should call your local electric utility's emergency line immediately. If you are an Xcel Energy customer please call 1-800-895-1999. Do not attempt to remove the limbs yourself as this could be fatal. Can you see electricity flowing in power lines or electrical wires? Answer: You can't see electricity when it is flowing through a circuit. But if electricity leaves the circuit, as it does when someone is shocked, you can see a spark. The spark isn't electricity itself. It is a flame that occurs when the electricity travels through the air and burns up oxygen particles. Answer: Well, yes and no. Yes, because you need energy to make anything happen—it's what makes anything and everything move, change, and/or grow. Everything that happens does so because of energy, and all living things use energy. But everything in the world does not use energy. For example, a rock on the ground and a car parked in a driveway do not use energy while they are sitting still. However, if you want to move the rock, or drive the car, you need to use energy to do that. How many miles of natural gas pipes are there in the U.S.? Answer: The interstate natural gas pipeline system contains over one million miles of pipe. That’s enough to stretch to the moon and back twice. Have you ever stuck a wire in an electrical outlet? Answer: Absolutely not! Sticking a wire in an outlet is a sure way to get yourself hurt—or even killed. Metal conducts electricity, so the wire would carry the electricity from the outlet right into your body. It’s a really bad idea. We would never do it, and you shouldn't either! I once saw a pair of shoes hanging from a power line. Why didn’t the shoes get burned up by the electricity in the line? Answer: Shoes hanging on a power line don’t get burned for the same reason that birds standing on a power line don’t get shocked: they don’t give electricity a path to the ground, so electricity stays in the line and does not go through them. But if the shoes were to touch a power line and a power pole at the same time, they would provide a path to the ground and would get blasted with electric current. It wouldn’t be pretty! By the way, if you ever see someone throwing shoes up onto a line, tell them to stop! The shoes can damage the power line, or someone trying to get the shoes down could be seriously shocked or even killed. Why does the flame on my stove burners look blue, but the flame of a campfire is yellow? Answer: Yes! An electric eel uses chemicals in its body to manufacture electricity. A large electric eel can produce a charge of up to 650 volts, which is more than five times the shocking power of a household outlet. Answer: The ancient Chinese were the first to discover underground deposits of natural gas. In 600 BC, Confucius wrote of wells 100 feet deep yielding water and natural gas along the Tibetan border. The Chinese piped the gas to where it was needed through long, hollow bamboo stalks. Answer: Neither! In the wires of an electrical circuit, the electrons are always jiggling around. When a circuit is closed to run an appliance or a light bulb, the electrons jiggle a lot and travel through the wire. 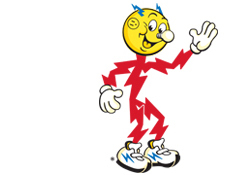 When the circuit is open, all the electrons just jiggle where they are—kind of like running in place. Why didn’t Ben Franklin get killed when he tied a metal key to a kite string and flew the kite in a thunderstorm? Answer: Ben Franklin’s famous key did give off an electric spark. But lucky for Franklin, the kite was just drawing small electrical charges from the air. If the kite had been struck by lightning, Franklin would have been killed! may be used only under license from Xcel Energy, Inc. © 2018 Culver Media, LLC. All rights reserved.